Technological developments in 3D bioprinting already offer first approaches to fabricate tissues and mini-organs within three-dimensional shapes by layering biological materials. This master's thesis explores possibilities of designing digital, generative modelling user interfaces to create vascularized tissues for 3D bioprinting. 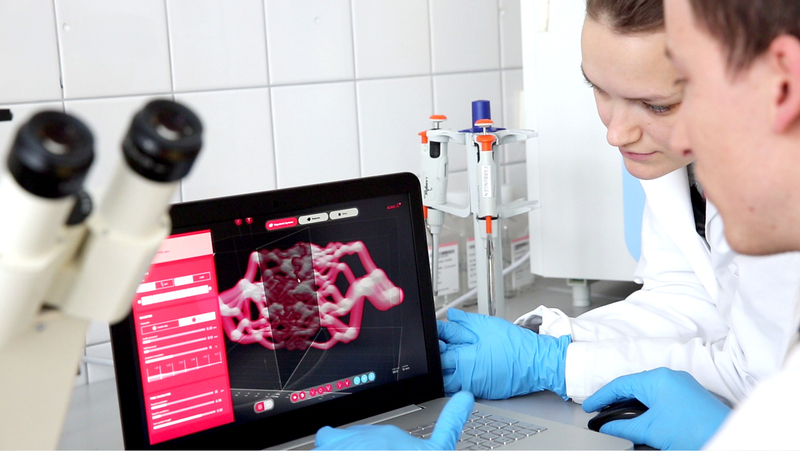 During the research process the application prototype „Bloodline Alpha 1“ was designed and developed to create customized, generative vessel systems for the Cellbricks 3D Bioprinter. First liquid streamed vessel systems in the micrometre range were successfully printed with bio compatible materials within laboratory experiments using the developed modelling interface prototype. This research project was developed in cooperation with the companies Cellbricks GmbH (contact person: Dr. Lutz Kloke) and Intuity Media Lab GmbH (contact person: Markus Turber, Christoph Witte). Software prototype beneath the Cellbricks 3D bioprinting machine. Bio-printed, synthetic vessel systems using the software prototype, which was developed within this thesis. Technological developments in 3D bioprinting already offer first approaches to fabricate tissues and mini-organs within three-dimensional shapes by layering biological materials, according to the image of a digital model. 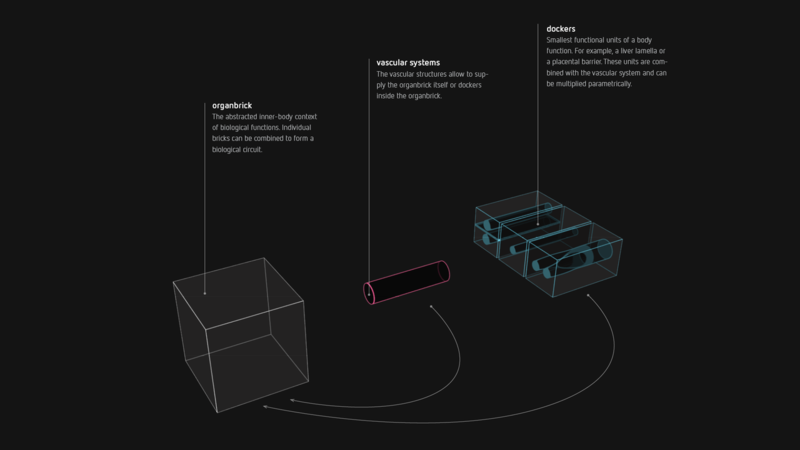 This development creates now the possibility to fabricate complex and individual designed, three-dimensional organ models out of living biological structures. 3D bioprinting offers a completely new space to design applications and products out of biological materials. 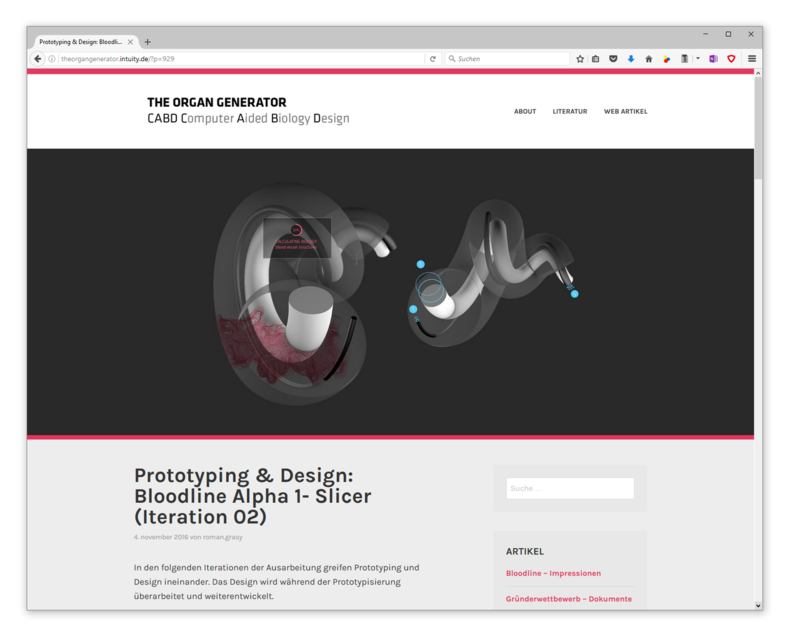 The research project “The Organ Generator” focuses on the modelling process before the actual bioprinting happens. The computer aided formation of three-dimensional, parametric structures of an organoid model, which is named as “organoid data body” within the following discussion. How can we design organ structures between the borders of biological characteristics and computer driven appearances and which formal language do the synthetic organ models follow? Unlike the construction process of materials such as metal or synthetics for e.g. mechanical engineering, biological cell-structures for the bioprinting process differ greatly. “Cells live and cells grow“. The computed three-dimensional structure has an influence on the function of an organoid and in this special case it has to follow a biological set of rules. Therefore it is necessary to use and control generative design algorithms at the centre of the modelling metaphor to imitate biological properties within abstract, geometric extracellular environments. The research within this thesis explores first possibilities of designing digital, generative modelling programs and user interface metaphors to form directed living, within synthetic tissues for 3D bioprinting. 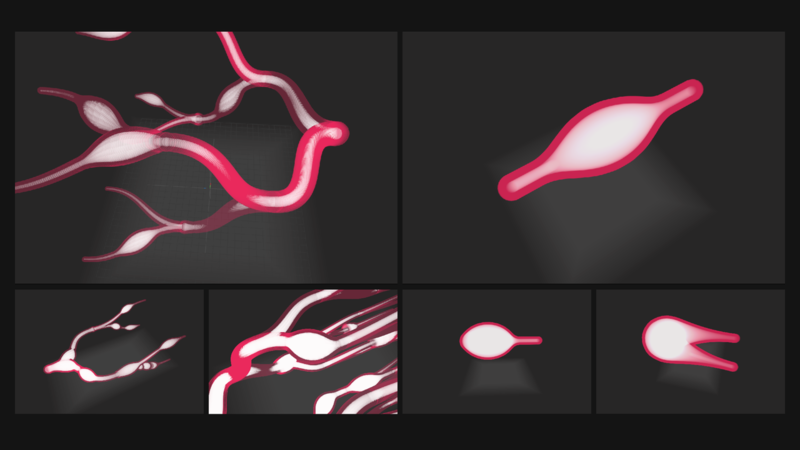 To limit the range of biological characteristics and sharpen the focus of exploratory research processes, the topic “generative vascularization of geometric basic bodies“ is focused as main characteristic for biological behaviour and defines the basis for the exploratory design and research process. The theoretical part of this thesis analyses and discusses current developments in the research field of 3D bioprinting and provides an overview around 3D bioprinters, organ modelling and tissue engineering. 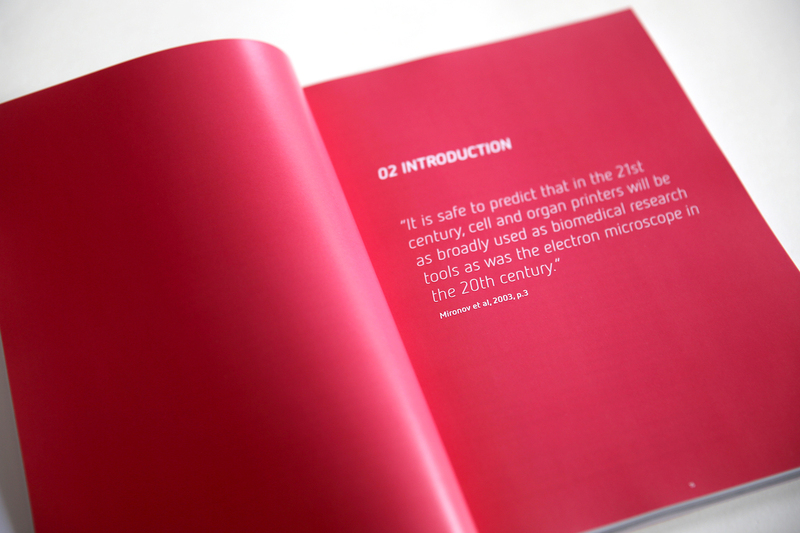 The theoretical knowledge is accentuated with insights from 4 expert interviews and presented in the form of a visual evaluation. 5 design relevant projects from different disciplines were selected to show inspiring insights towards interpretations at the border between computational design, software development, science fiction and biotechnology. All insights of the theoretical compilation are reflected and discussed. For the practical research, design guidelines and concepts are derived based on the theoretical fundament. The practical research part is divided into 6 main exploration phases. The intention is to identify opportunities and to discover boundaries of modelling 3D printed organs in a generative manner. Organs in this case are defined as design objects and abstracted outside the physical context. The developed concepts, designs and prototypes illuminate perspectives how to deal with digital organ modelling. 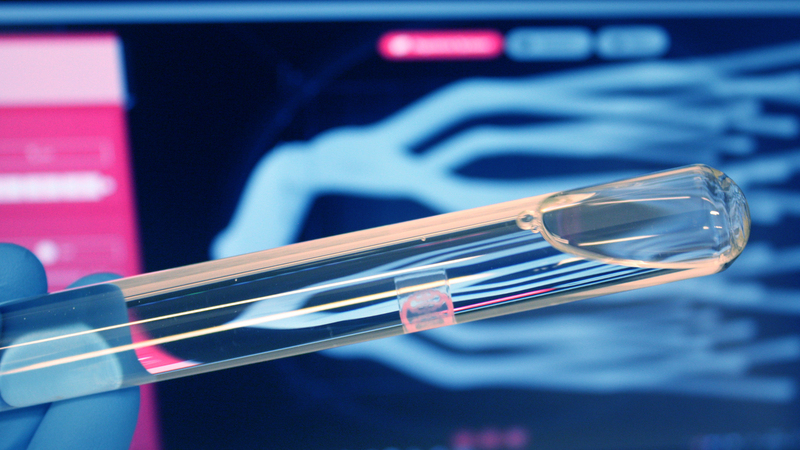 The research focus moves between current possibilities within pharmaceutical and medical test setups towards speculative design drafts to illustrate further possibilities. The key focus of this project is to create generative designed vascularized organoid data bodies. All systems of the human body are indeed very complex. In the research field of 3D bioprinting, these is a need to reduce complexity. Start simple to become complex. 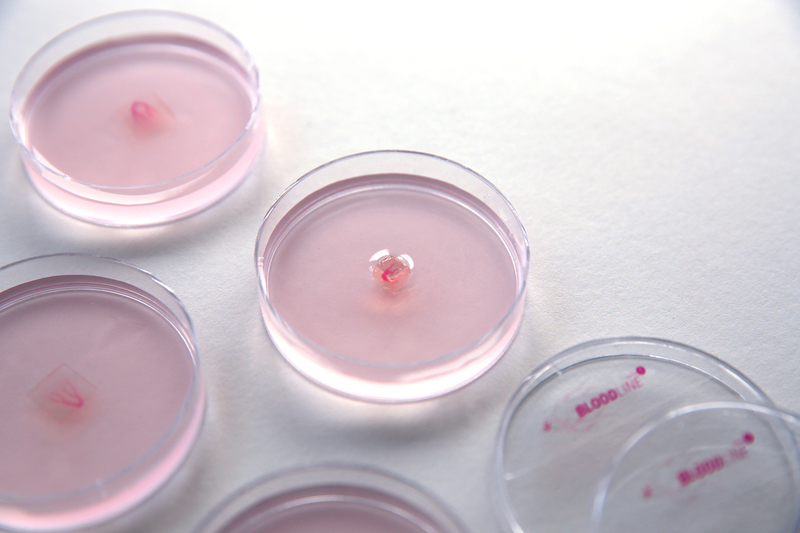 The current research within 3D bioprinting of Cellbricks is focussed on small organ models in the micrometre range (between 0-10mm), which are defined as organoids. The related modelling concept focuses on this small space. How is it possible to abstract organ function within a modular modelling system in order to create a structure to start from? Strongly abstracted in terms of organ modelling within 3D bioprinting, it is possible to divide vascularized organoid data bodies into smallest functional units of an organ, called “dockers”, and a vascular system. Both in combination, enriched with cells, represent a circuit of biological behaviours. As modelling concept, this composition is called “Bloodline”. It defines the geometrical, abstracted intestines of the organoid data body. The vessel system is one of the key components for organoid data bodies related to the bloodline modelling concept. The vessel system supplies the printed organoid models and all related formations within the object with nutrients. Extracted from the theoretical research, the vessel system follows a set of rules which can be described geometrically and modified generatively. And from the design perspective this system is indeed a very interesting component for exploring the parametric modeling. The related image material shows an experimental series of 9 variations of generative designed vessel tree systems. Starting From linear vessel tree systems through mirrored 3D structures to force effect deformation parameters. The studies were illuminated from the functional perspective and in the form of aesthetic, structural appearances. 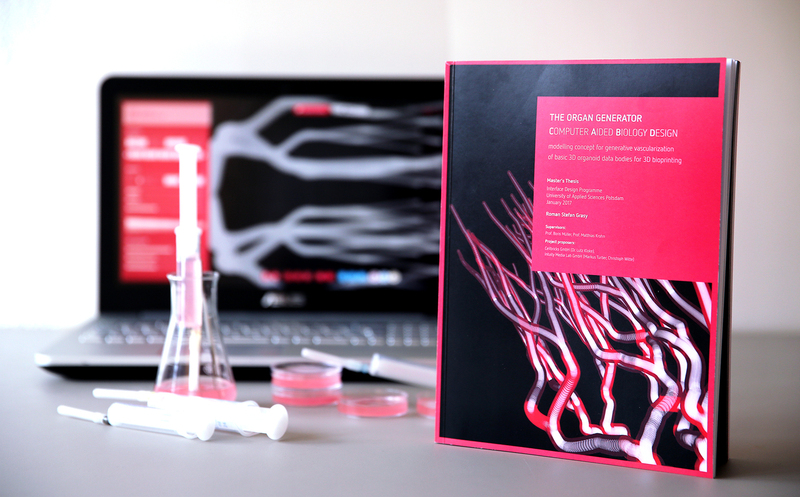 The application draft “Bloodline Alpha 1” transfers the explored generative structures towards a user interface for generative organoid data body modelling. It defines an application, which is able to form the generative vessel structures within organbricks in a controllable and accessible manner. The user has the ability to define several vessel systems and interact with the generative variables to create customized vascularized objects for the bioprinting machine. The software interface is divided into two main areas. These laboratory experiments show the transfer of the designed modelling concept bloodline towards the creation of first simple, customized bio-printed vessel systems. 4 successful printed vessel systems with visible vasculature and one printed vessel system, which is able to transfer liquid media, were manufactured with the Cellbricks Bioprinter and the data set exported from the application prototype to offer first insides and evaluate the designed modelling concept. The laboratory experiments took place at the Technical University of Berlin within the laboratories of Cellbricks. 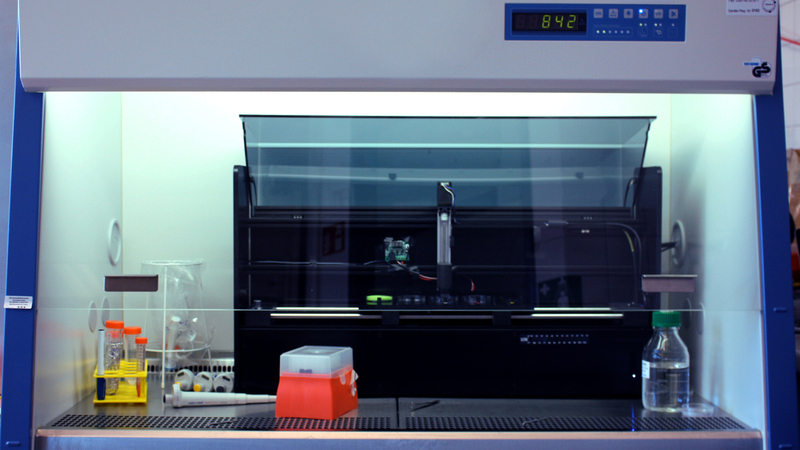 The picture shows the Cellbricks 3D Bioprinter prototype in a sterile environment. 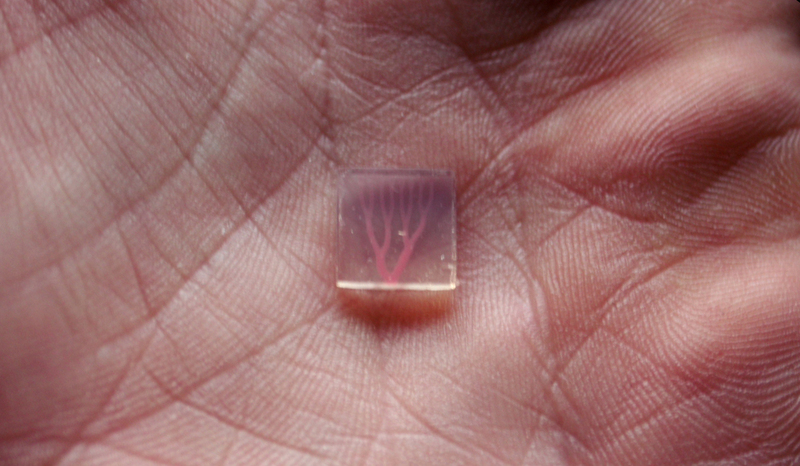 All following images show vessel systems, printed with bio compatible materials (bioink). The tests were carried out in cooperation with the tissue engineer Alexander Thomas from Cellbricks. The printing experiment took 3 days. Because of the printing time only simple and smaller objects were chosen. This flat bloodline shows a 2.5D vessel system, which was deformed by the attractor deformation parameter. Further impressions of the printed results. The intention of this research work was to identify opportunities and to discover boundaries of modelling 3D printed organs in a generative manner. Therefore organs were defined as design objects and abstracted outside the physical context. The developed concepts, designs and prototypes illuminate perspectives how to deal with digital organ modelling. But indeed, the way to create digitally designed and functional bio-printed biology is still a long way. This research defines only a first starting point to build on the findings. Our world transforms more and more complex and the use of algorithms to support design processes becomes increasingly important. In general, the parametric, generative modelling of biological bodies offers a clear advantage towards forming patterns, based on designed rulesets. Structures can be generated and explored more quickly and the amount of variants increases exponentially and the computer defines itself as a design partner. In this case as a conclusion is to highlight that design as a discipline is indeed an extremely important interface within this currently experimental research field of 3D bioprinting. The methods of the design profession put the practical design draft at the centre of the research work. This indeed quickly creates a visual results or haptic experiences. During this research project, models from subject-specific biotechnological knowledge were extracted, visualized and explored within generative prototypes. Finally, the rulesets were translated to user interfaces, which try to make these models accessible to a broader field and the concepts were extended speculatively to create picture for inspiration and further research questions. Beneath to the opportunities and values, the boundaries of the current research results also have to be discussed. Within this research project, only a small part of the organ functions has been explored which are generally conceivable. This becomes more clear by considering that the exploration within the laboratory work in the field of 3D bioprinting stays at the beginning. Generative organ modelling first becomes mighty if further smallest units of organ functions can be integrated. When organs can be linked to other organs and interact within a synthetic, nutrient streamed environment. But to reach this goal, first simple models have to be tested and analysed within laboratory setups, enriched with cell cultures. What has been offered within this research project is that the complexity of digital organ models can only be achieved by working together within interdisciplinary teams in order to pool domain knowledge and extract concepts and models in collaborative iteration processes. 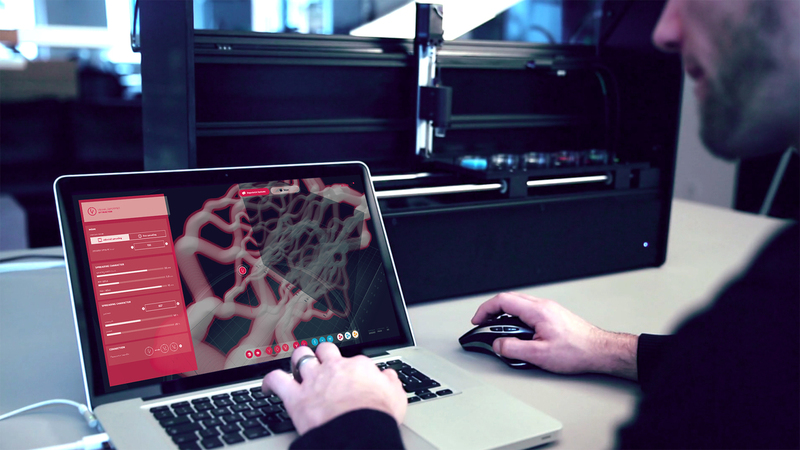 Beneath modelling, 3D bioprinting offers complete new spaces for living products and services. Outside the human body and inside the human body. The design profession is questioned in this case to identify design related questions and offer possibilities towards these new technological developments. Which products do we want to create of we can can manufacture organic circuits or in the future produce individual, transplantable organs? But at least, also critical design is questioned. We have a great responsibility, together with related disciplines how this technology will be used. To what extent do we deal with the creation of synthetically shaped life? What ethical issues do we need to consider and what limits do we need to define as a society? 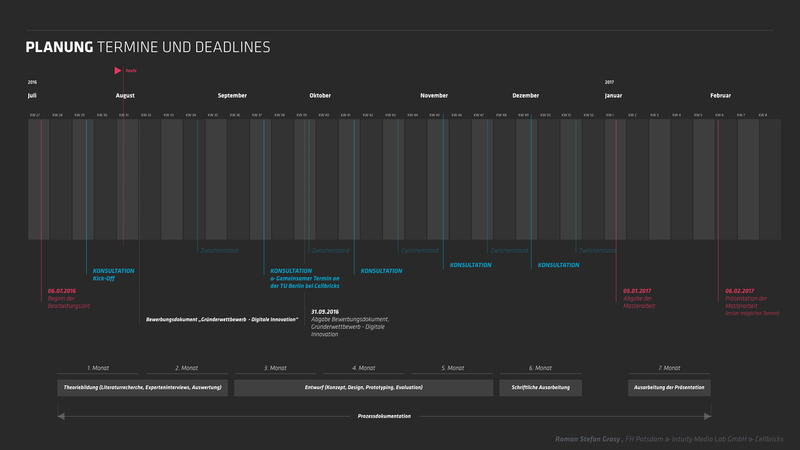 This thesis followed an iterative design process. The foundation of the theoretical knowledge was extracted through literature research and expert interviews. All theoretical insights were translated into design guidelines and concepts approaches, which were taken as fundament for a practical design exploration. The practical design research process included, concept visualization, generative design prototypes, user interface design & prototyping, laboratory experiments, hardware speculation & software speculation based on the theoretical knowledge. All visual and haptic results were discussed, reflected and iterated with the domain experts from the cooperation partner. The research process was planned using a phase structure plan to organize the research procedure and to define milestones and deadlines. All interim results and milestones of this project were documented on an online platform, which was accessible for the cooperation partners and the supervisors of this thesis. Kwinter, S. (2011). The Computational Fallacy. In Menges, A., & Ahlquist, S. (Eds. 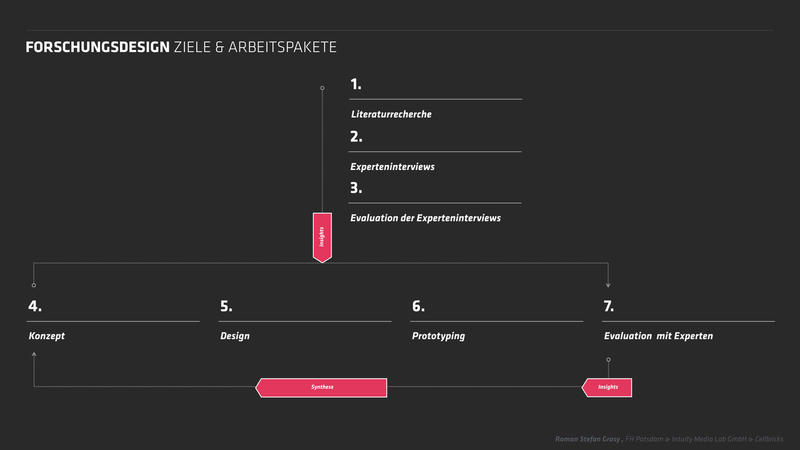 ), Computational Design Thinking. (p.211-215). John Wiley & Sons.